For the sake of fairness to the reader, I need to preface this by saying that I quite like Burnout: Revenge, because I\'m going to spend the next several paragraphs making unfavorable comparisons to Burnout 3. As a general rule, I try not to read other people\'s reviews before I play a game. However, when Revenge was released I had just finished Burnout 3, and I eagerly dug into any and all media about this new title. Numerous reviews have taken the stance that Revenge makes dinosaurs out of all the previous Burnout games, and I think this is a ludicrous idea. In my mind, Burnout 3 is still the apogee of the series, but beyond that, Revenge is a fundamentally different game than any of it\'s predecessors. The differentiation I have made is that Burnout, Burnout 2 and Burnout 3 were all, at heart, racing games with an action twist. Burnout: Revenge is an action game that happens to take place in a car. To those unfamiliar with the series, the Burnout games have had the basic premise of gaining \"boost\" (which is just like a \'turbo\' bar that\'s been done in hundreds of racing games before, which provides drastic acceleration for a limited period of time) by \"driving recklessly without actually getting into accidents\". For the first time, in Revenge, drivers are actively encouraged to ram traffic. This is a complete departure from the Burnout I know and love. I\'ve learned to love Revenge, but it\'s a tough sort of love. In Burnout 3, even slightly touching a car in traffic was almost a guarantee that you would get into an accident. You could ram your opponents, true, but you had to be extremely mindful of traffic while doing so. This meant that when all was going well, I would often leave a 200 foot stretch of highway in my wake littered with traffic and opponents. Revenge twists this idea by allowing you to ram same-direction traffic to your heart\'s content (in fact, you\'re given monetary points for doing so ? something that previously only existed in the games\' \"Crash\" modes). The end result of this is that when all is going well, you\'re quite likely creating chaos on the pavement in FRONT of you, instead of leaving it in your dust trail. The other key gameplay difference between Revenge and its predecessors is that there are now numerous Need For Speed style shortcuts through every track ? in fact, there are so many shortcuts and multiple routes, that you\'ll be hard pressed to do some circuits twice in the same way, even if you\'re trying. Overall, I like the diversity that the multiple paths provide, but it creates a major problem, as well: when paths diverge, more often than not, there\'s some kind of spike (or wall, post, board, barrier, etc) in your way that will lead to an explosive crash if you\'re not completely \"on the path\". This is in stark contrast to Burnout 3, which gave me the feeling of being strapped to a rocket in a glass maze ? as a general rule, the game would \'guide\' you around curves and let you take them at full speed at an extreme angle. Not only does Revenge not do this, it will literally guide you into walls more often than not, which struck me as odd, since the demographic that stands to be annoyed by this the most is people who have been playing the series consistently. In later races in Revenge, Crashbreakers become \"armed\". Again, for those who have never played this series before, a crashbreaker involves making your car explode to use it as a weapon to take out other cars and trucks. In Burnout 3, the only place this appeared was in \"crash mode\", which is a series of short puzzle events where the goal is to cause as much monetary damage to other vehicles as possible. Crash mode returns in a somewhat different form in Revenge (more on that in a moment), but crashbreakers also appear in race events ? you can use them after you\'ve crashed to cause opponents that are behind or near you to crash (and recharge your own boost in the process). The end result of all of this is that Revenge firmly places the emphasis on destruction, while I thought that Burnout 3 was oriented towards perfection. The intense bursts of attentiveness that periodically spike in my brain are still present in Revenge, but the overall feeling is more \"twitchy\" than \"glassy-eyed gaming Zen\". 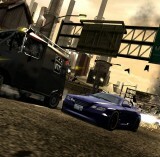 Crash mode returns in Revenge, and while it looks more polished than it did in Burnout 3 owing to some glitzy camera pans and post processing effects, these same elements distract from the mode itself. Additionally, all the power-ups have been removed from Crash mode, and the player needs to perform a key combo (similar to teeing off in many golf games) to ensure a \"fast start\" in Crash. There\'s still the distinct feeling that each Crash level is a puzzle that needs to be solved, but none of it feels as tight. There is a higher level of particle and physics detail throughout Revenge than in any of the previous games. In spite of this (or perhaps because of this), I do not think that the graphics look quite as sharp overall. I really liked the \"glass tunnel\" feeling that Burnout 3 gave me, and Revenge simply looks different. Some people will probably point out that the new game has better physics and possibly higher polygon counts throughout. Be this as it may, it looks a bit different than any of the other games, and I don\'t like it as much. I have just touched on all of the gameplay differences that I noted between Revenge and Burnout 3. In almost every other area of navigation, Revenge falls flat on its face. The highly functional \"crash nav\" from Burnout 3 has been replaced with a silly and unintuitive series of numbered stages. The load screens animate in a way that reminds me of someone angrily drumming their fingers, and I find it disconcerting. There seem to be more load times overall, as well. EA Trax... well, I suppose the EA Trax aren\'t any worse than in any other modern EA game, but Revenge was the game that convinced me to finally rip some of my own CDs to my XBox so that I didn\'t have to hear a random assortment of \"what\'s popular right now, plus some stuff that we\'d like to be\". The freaky sound of metal scraping metal at an extremely slow speed is still present when you crash and activate \"aftertouch\" (essentially, when you crash you can slow down time and retain some control over your wreck for the purpose of wrecking other cars) ? but I don\'t think it sounds half as creepy, or as cool as in Burnout 3. This may be partially because aftertouch doesn\'t seem to slow things down quite as much in Revenge as in Burnout 3. That\'s fine with me, but I did note an annoying tendency for a car to be fifteen feet away from crashing into my wreck, only for my crash to be \"over\" before I could land the \"aftertouch takedown\" that I\'d be awarded for managing to get an opponent to crash into me. This may be a fluke, but it happened to me about fifteen times the first afternoon I spent with Revenge, and I never noticed this happening in Burnout 3. The multiplayer modes are all exactly what you\'d expect. You can race against (local, system linked or XBL) opponents in a variety of ways, as well as a \"team crash\" mode where you attempt to work together to cause a spectacular accident. The best things I have to say about Revenge are that the game is still a hell of a lot of fun to play, and the changes that have been made are, if nothing else, a step further towards \"this is not a racing game, this is Burnout!\" For this reason, I found that I was frequently reminded of the PC games Carmageddon and Carmageddon 2 while playing Revenge. If you\'ve never played any of these games, my advice would be to go out and buy Burnout 3, as it\'s $14.99 most places at this point. Additionally, I would say that action gamers who have a bit of a taste for racing would be well advised to check out Revenge ? if you can get over its multiple interface problems, there\'s a meaty and unique game underneath. Ironically, people who have been fans of the series for quite some time would be advised (more strongly than a Burnout newbie) to rent this game before buying it, because the paradigm has shifted from perfection to chaos, and the feeling is rather different.